Canine seizures can be frightening events for both dogs and the people who love them. Learning more about what actually goes on during a seizure and what causes one may help you deal with the situation if it arises. What Happens During Canine Seizures? All seizures are the result of abnormal brain activity. Typically, something causes the brain to send out an electrical impulse that goes awry. The brain interprets this false signal as a call to activity and triggers uncontrolled muscle movements governed by what ever part of the brain is being affected. Your dog may act dazed, confused and may not seem to recognize you. 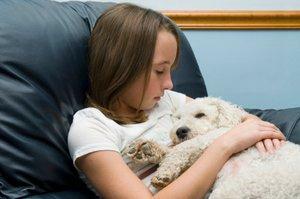 Your dog may begin to whine and behave anxiously 24 hours prior to a seizure event. One or more areas of your dog's body may begin to convulse uncontrollably. Your dog may salivate without control and gnash his teeth. The eyes may roll up and back toward the head. Defecation and urination accidents are also common during a canine seizure. In the aftermath of a seizure, your dog will appear exhausted and slightly confused. He will also likely become ravenously hungry and thirsty. It is best to offer food and water in limited, but frequent, doses for the next 24 hours. This helps keep your dog from over-indulging which can lead to vomiting. Partial: This type of seizure only affects a small portion of the brain, so a loss of physical control would only be seen in specific parts of the body. General: A general seizure involves the entire brain, therefore the entire body would display physical signs of the seizure. Psychomotor: This type of seizure is distinctly different from the types mentioned above. The outward signs are predominantly behavioral, such as barking and whining for no apparent reason, walking in circles or unusually aggressive behavior. A psychomotor seizure can sometimes be a warning signal that a partial or general seizure is on the way. Primary: This classification is used when no actual cause of the abnormal brain activity can be diagnosed. Secondary: This classification is used when there is an identifiable abnormality in the brain. Reactive: This type of seizure happens when an essential healthy brain is exposed to outside forces such as toxins and accompanying illnesses. Are All Seizures Related to Canine Epilepsy? Head trauma: Any dog that has received a blunt force blow to the head, caused by collision with an automobile or other means, is likely to experience seizures. Sometimes these seizures appear years after the accident. Brain infections: A brain infection can also trigger unusual brain activity, and is most commonly diagnosed with a spinal tap. Brain tumors: An undiagnosed brain tumor can put pressure on the brain tissue as the growth enlarges. This can result in intermittent yet increasing seizures. Tumors of this nature are typically diagnosed with an MRI, and are possibly operable if caught early enough. If diagnosed in later stages, it may be necessary to treat with medications to reduce brain swelling and control the frequency and intensity of the seizures. Metabolic imbalances: A metabolic imbalance affects brain chemistry and can cause faulty brain signals that induce seizures. Exposure to toxic substances: The body can react to toxins in many ways, including vomiting, cardiac arrest and seizures. Other diseases: Conditions like hypoglycemia and hypothyroidism have also been known to trigger seizures. Autoimmune diseases, which are more common in certain breeds, can also trigger brain diseases. The best way to treat canine seizures is by treating the actual cause if a specific medical or environment cause can be determined. This will most often cause the seizures to cease. However, there are cases where the episodes can only be managed to provide a dog with greater relief. In these cases, phenobarbital, potassium bromide, diazepam (Valium), gabapentin (Neurontin), levetiracetam (Keppra), or zonisamide (Zonegran) may be used to control, and possibly prevent, recurrent episodes. If your dog experiences a seizure, it's important to keep him comfortable and away from anything that can injure him. Don't try to grab his tongue - he won't swallow it and you may inadvertently get bit. Try to time how long the seizure lasts and record the date and any details in a notebook. If your dog is actively convulsing for over five minutes or having difficulty recovering after the seizure, this is an emergency and you should seek veterinary care immediately. Otherwise, call your vet and alert him or her to the fact that your dog has had an episode, and your vet will advise you on how quickly your dog needs to be seen. If this is the first time your pet has had a seizure, then you should plan on taking him in for evaluation, even if he recovers and seems to be normal.